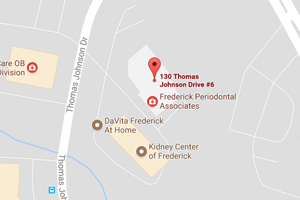 Each visit at Frederick Periodontal Associates seems to be a stress reliever for me. Dr. Snyder and Carolyn are absolutely personable and genuinely concerned and very thoughtful. The location has enough parking spaces. The reception area is quite relaxing, and the exam rooms provide adequate privacy and space. Dr. Snyder provides his honest opinions and offers very realistic advices. I Highly recommend them for your periodontal needs!